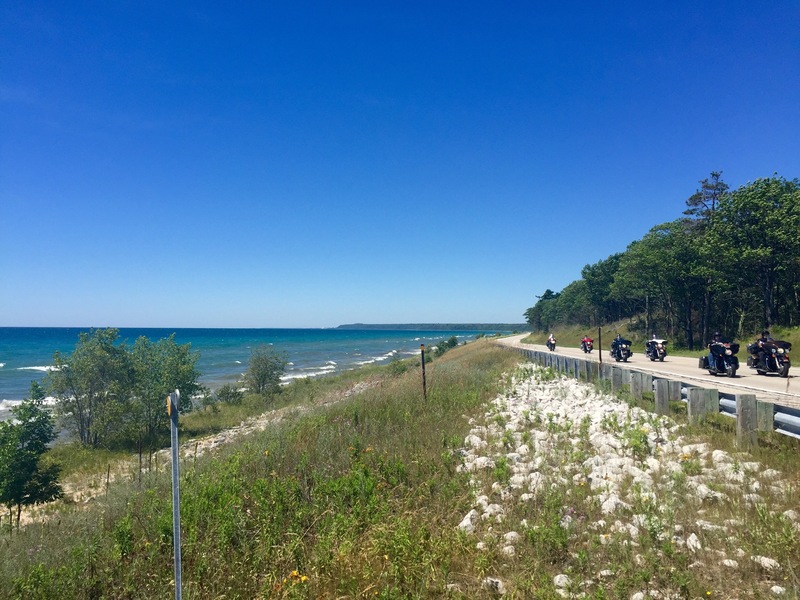 Day 46, 7/29, Indian Lake, MI to St. Ignace, MI: 96.8 miles, 1,852 ft elevation gain, 13.6 mph average speed. Trip totals: 2,775.6 miles (71.2 daily average), 115,931 ft elevation gain, 12.5 mph overall average speed. We hope you have a “wonderful” day! 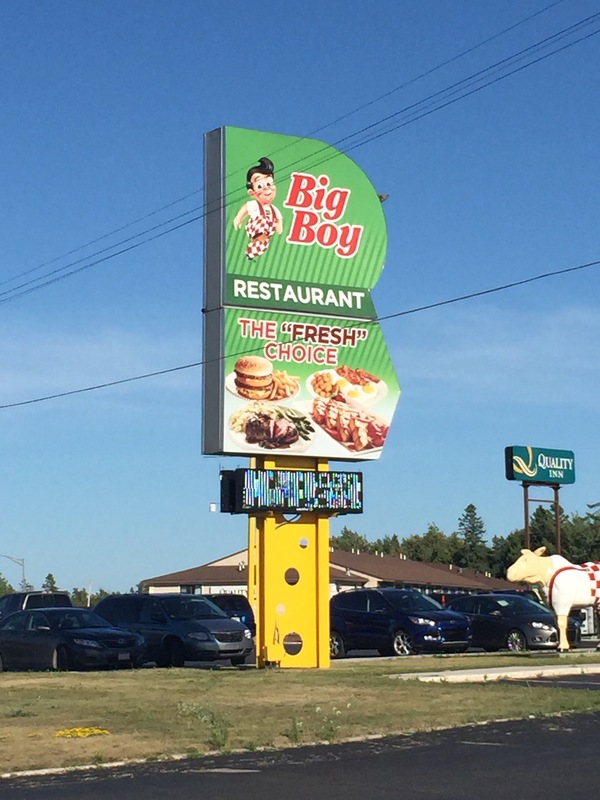 Big Boy Restaurant. The “fresh” choice. 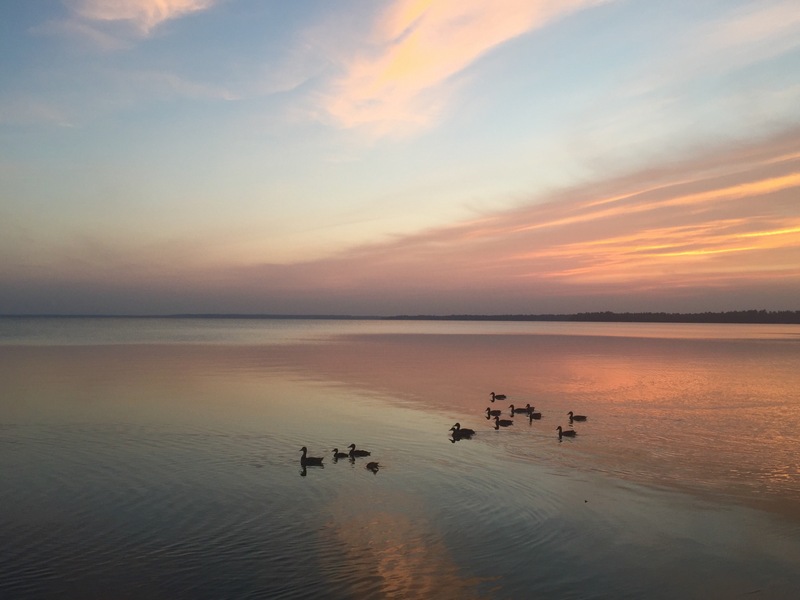 On to more interesting and important things, like the sunrise Michigan gifted us this morning. Probably the best sunrise I’ve seen in my life, but definitely the best of the trip. Did I mention that this was the view from our tent? Needless to say, we woke up feeling very lucky today. 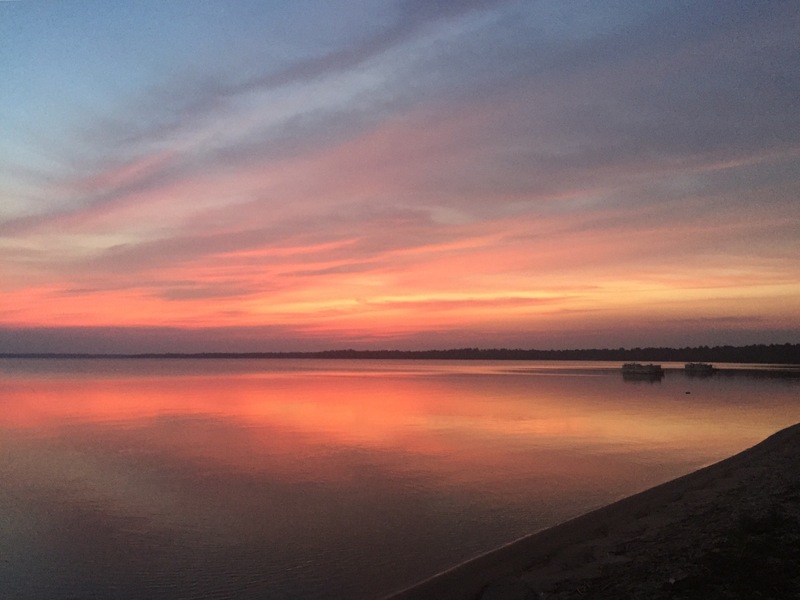 Especially because we got a sunset from our campsite last night; how often do you get a sunrise and a sunset from the same campsite? Or either from any campsite? As usual, Ted had to wake me up to watch the sunrise in the midst of doing all of the packing work. He even removed the rainfly for me so I could watch the sunrise while I packed up my sleeping pad in the tent! I don’t know how he puts up with how slow and grumpy I am in the morning, but he does it every day with a smile on his face. We started off around 6:30a (not bad, not great) and it was the perfect temperature for riding. After about 6 miles on quiet state roads, we entered Manistique, a tourist town that seemingly required all of the businesses to have 50s-era signs. Then we got on US 2, where we would spend the rest of the day. 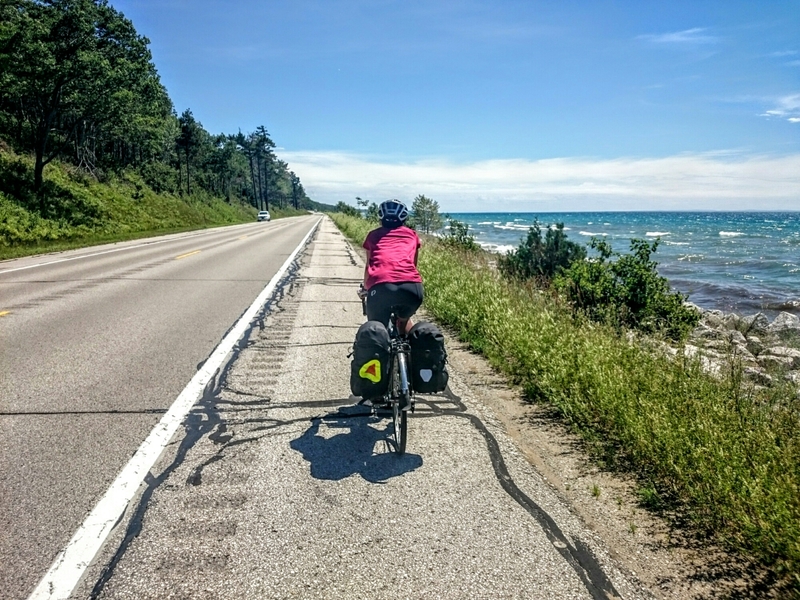 US 2 follows the northern coast of Lake Michigan and we were promised miles upon miles of lake views. 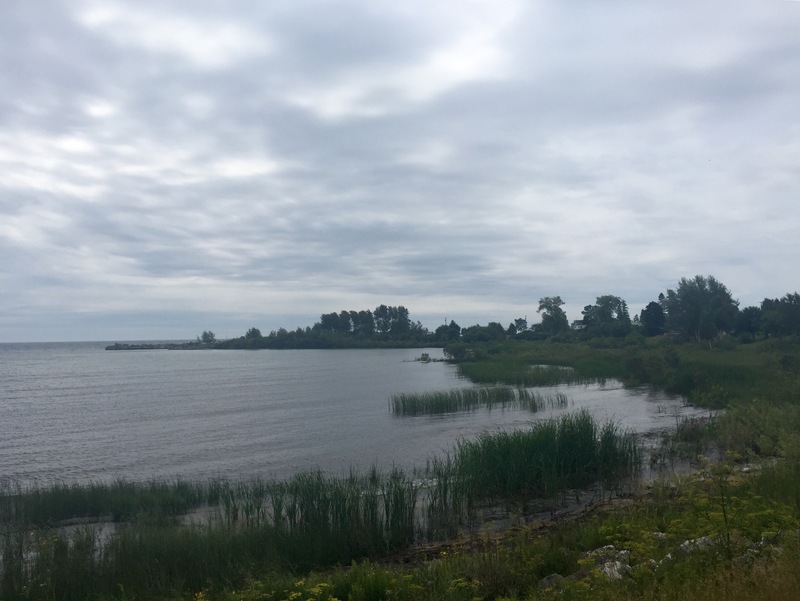 We technically had miles of lake views, less than 10 miles, but the other 80+ miles were boring, high-traffic highway riding. The good thing about boring riding, though, is that it usually equals flat riding, and today was no exception. Just a couple small hills the whole day, mostly toward the end. And the good thing about highway riding is that there’s often a giant shoulder, so it’s fairly low-stress despite the traffic. The road was lined with motels and resorts for much of the day, many of which were closed or for sale, few of which had many cars parked in their lots. It seems tourism in the UP is past its heyday. Every once in a while we could see turquoise water peeking out between pine trees in less-dense portions of the forest that separated us from the lake, so we were excited for those miles upon miles of lakeshore riding everyone told us about. We hit a grocery store about 20 miles in and decided it was time for breakfast. 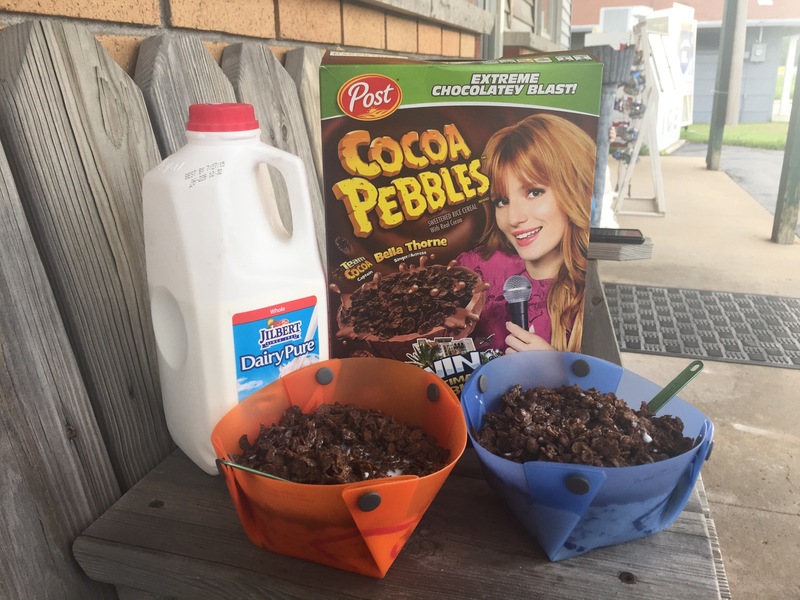 The store had a pretty limited selection, so we decided to feed an ongoing craving we’ve both been battling: Cocoa Pebbles. Have you ever seen two people devour a box of cereal and nearly a half gallon of whole milk in under 5 minutes? It’s probably not a pretty sight, but we both enjoyed every pebble. We rode for 30 more unremarkable miles before stopping for smoothies and free WiFi. The shop also sold pasties, the UP’s version of a meat pie, so we got one of those because everyone we met told us we had to try one. We also got a cinnamon roll, for good measure. The pasty tasted like a samosa that was missing all of the spices that make samosas taste good. It came with a side of ketchup that was, I’m not kidding, a quarter of a cup large. I guess that’s the alternative to spicing the filling? Everything else was good, and we sat for a little too long, as we do, fighting with the slow WiFi. 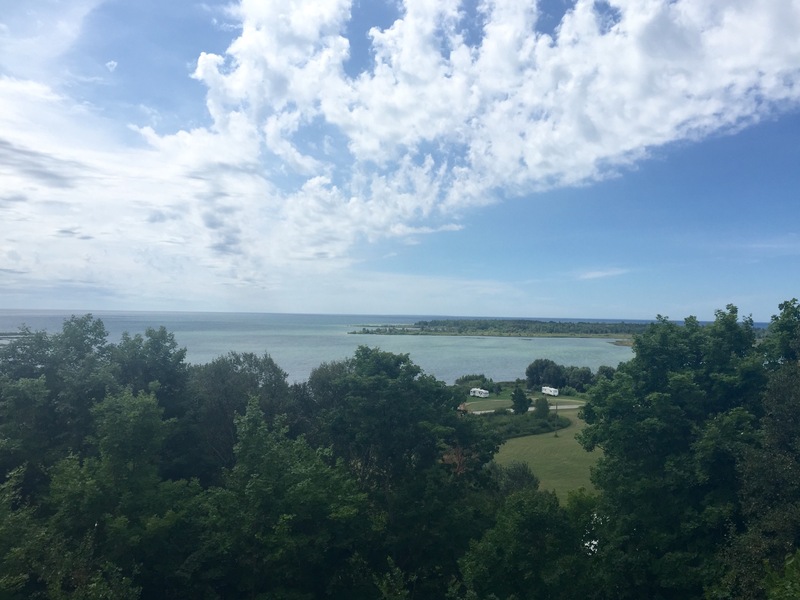 We rode for many more boring miles punctuated by small tourist towns until we finally encountered those views! 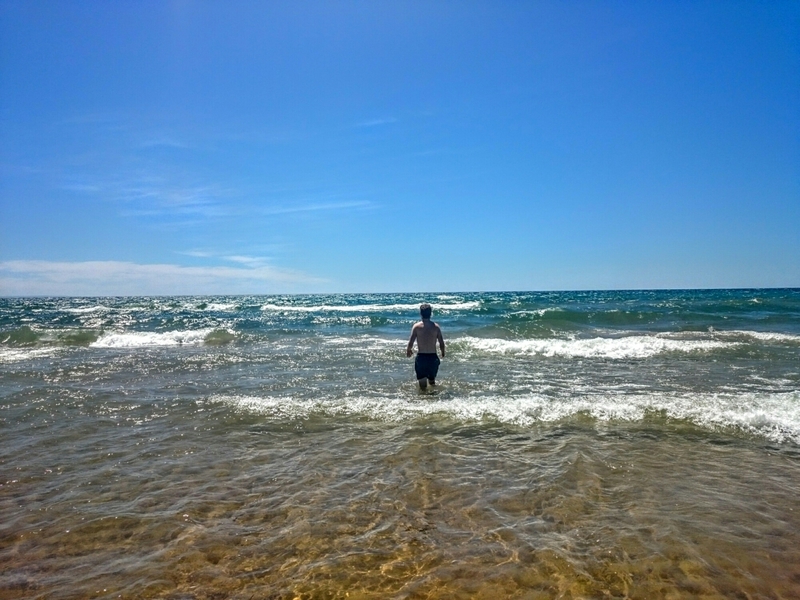 Lake Michigan is gorgeous–the first non-brown water we’ve seen since Glacier–and the crosswind we had all day created waves that made the lake look like an ocean. The first pictures below are from the gloomy (read: pleasantly cool) morning, and the last pictures are from the sunny afternoon. We noticed that lots of people parked their cars on the shoulder (annoying, because it’s our lane) to swim in the lake, so we made our first spontaneous decision: lake swimming! 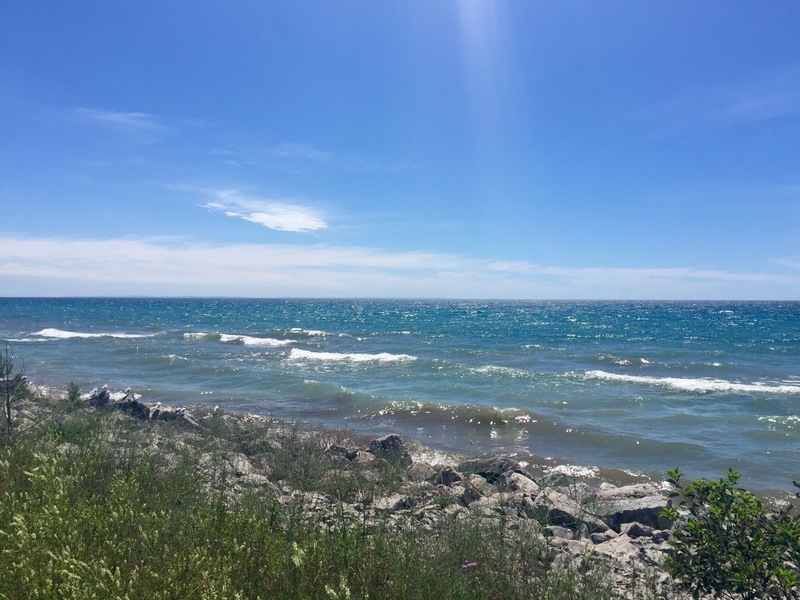 We swam for a bit, and Ted bodysurfed with surprising success (his first ever successful body surfing in a lake), before eating some cheese curds and beef sticks on triscuits by the lake. It was a lovely way to spend an hour. 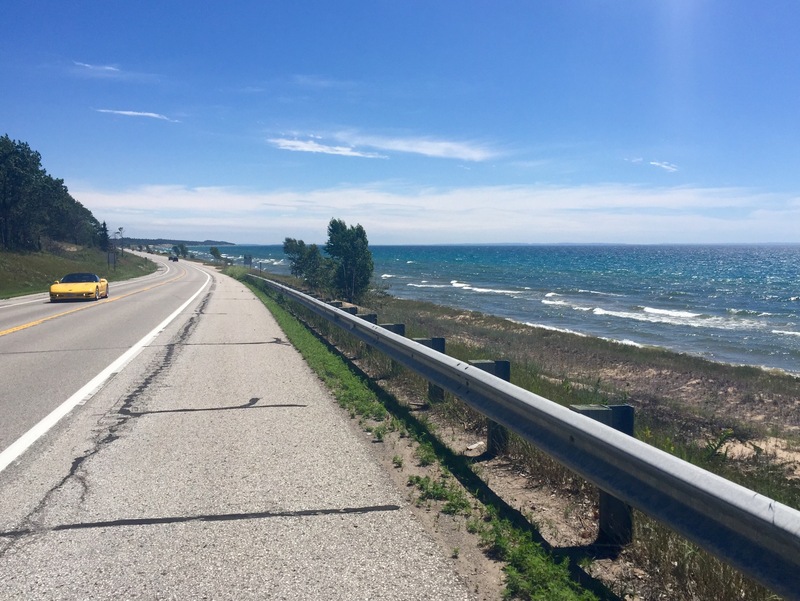 We headed down the road for the final 15 miles before we hit St. Ignace, the last town in the UP. 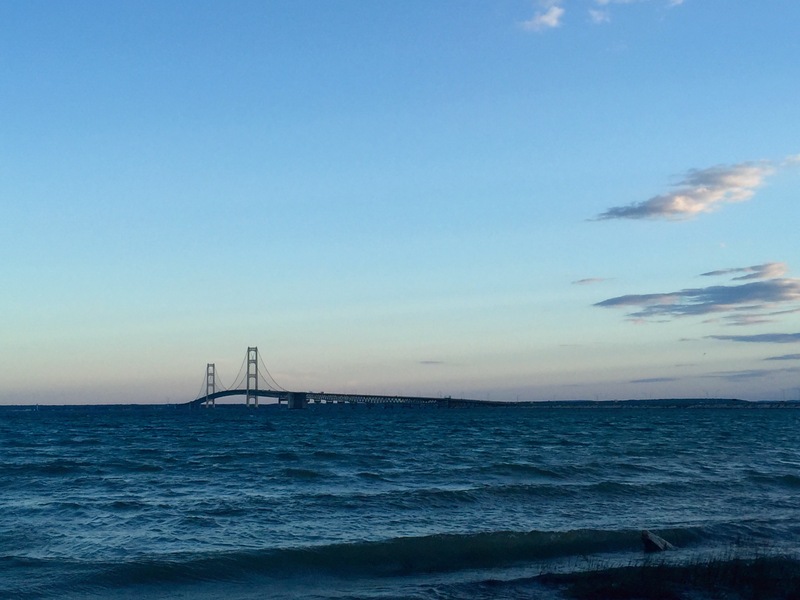 The options for getting to the mitt of Michigan include taking transport over a massive bridge on which bikes are prohibited or taking a ferry to Mackinac Island, a tourist island that is 80% state park and only allows bike and horse traffic, then taking another ferry to the mitt. 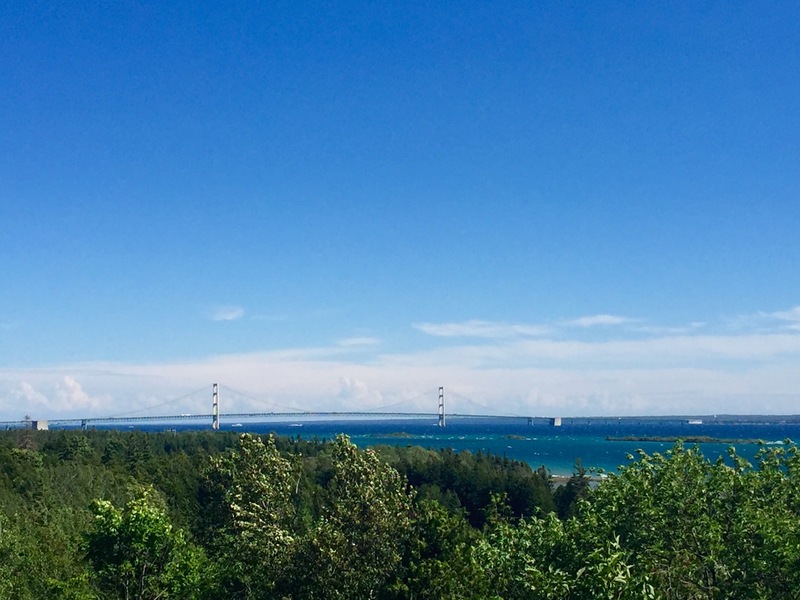 The plan was to take the bridge transport because even though the island is supposed to be incredible, we’re running short on time and have an aggressive schedule for the next week to get to Niagara-on-the-Lake to visit Ted’s family. 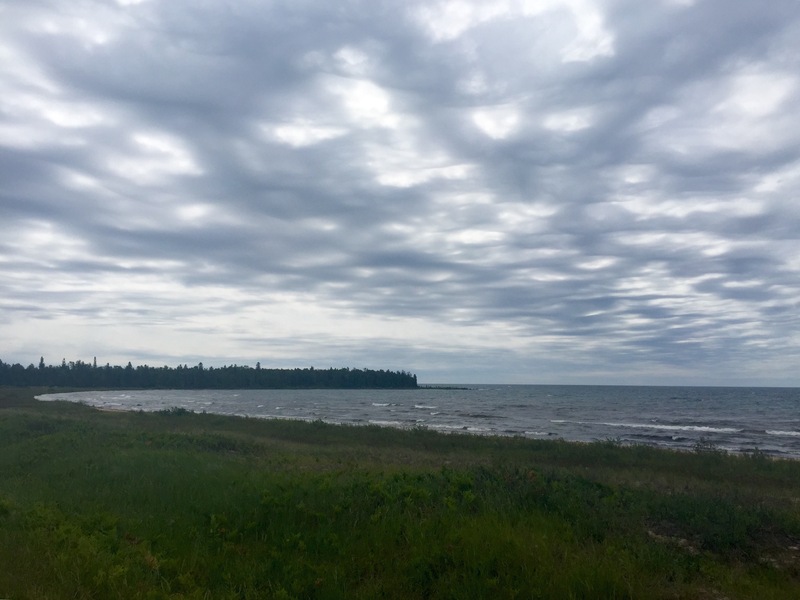 As soon as we got to St. Ignace, though, we decided that since we will probably never visit this corner of the world again, we should go to the island. Spontaneous decision number 2. This was great news to me because it cut 11 miles off of an already long day, and those miles would have been directly into a headwind. We found a state campground in town and settled in for the night. We then took a quick ride to the beach for a failed attempt at watching another sunset (blocked by a hill), then, spontaneous decision number 3, we rode our bikes to the grocery store to buy peanut butter Oreos and a small bottle of milk for dessert. A man who bike toured extensively in the 70s came to our campsite to chat for a bit. He made me very grateful for all of the progress bikes and camping gear have made in the past 40 years. We will wake up early to take the earliest ferry to Makinac Island tomorrow! 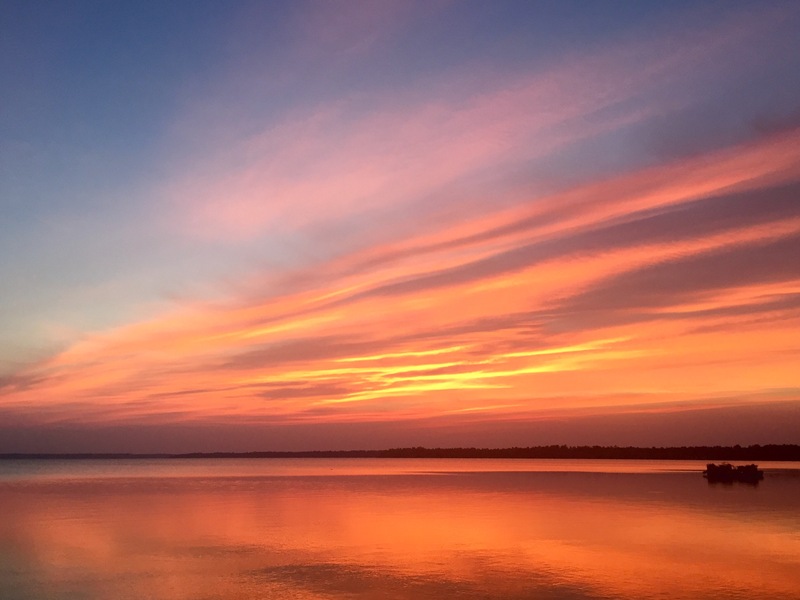 Also randomly commented to my friends today on how cool it is to be staying on the northern side of an island, so you can see the sunrise and sunset over water in the same spot, before I even read your post. I think your trip sounds incredible and hope to one day be able to do one myself. Keep on biking on. It is way more impressive than what your grandma Parson lead me to believe (DC to Brooklyn) That seems pretty amateurish in comparison to your actual trip. Can’t wait to see you guys in person and talk about your adventures! Haha, I want to try that cereal combination! You’ll have to let me know how it goes. Are you currently staying on the north side of an island? If so, I’m jealous! You should definitely do a bike tour someday; I’ll try my best to persuade you!